As I mentioned in previous entries, I have gone back to my roots, literally! Since November 2009 I have raced four trail races – true cross country with hills, roots, rocks, mud, and loved every mile. I started out at age 11 running cross country. These trail races have been a way for me to return to some of my favorite running and racing times – high school and college cross country. I guess I enjoyed the cross country racing so much it seemed like a natural progression to hit the track too. As a high school cross country and track coach I see the year in seasons – build a base, strength work, speed work, peak at the end of the season in key races, and then recovery time. I don’t see a year as road racers do – train and race pretty much the same all year. So as the high school track season has come to an end I find myself entering an open track meet on May 16 where I can race the 1500 meters, a race I have not run since college! Wanting to be as prepared as possible, I decided to run a 1500 meter time trial today at 1:00 in the afternoon on a black track with no shade in sight. Let me just say that summer is here in Florida! Luckily I was joined by some young runners – Di, an 18 year old senior from the track team and two early twenty-something guys, Maverick and Eric. We were timed by Kaitlyn and Amanda from the track team. It was great having all this support! I mention the ages here because it should be noted that I am twice Di’s age. I am now twice the age of the seniors I coach. Still trying to accept that fact. Anyway, today was my day to not be the coach. So we warmed up as a group and prepared for the task at hand. I told everyone my goal pace and even though they were faster than me, they ran with me, paced me, and encouraged me. It was awesome! I ran the first 2 and 3/4 laps at exactly the pace I thought I might be able to run based on current race times. It was so cool, 1:07 for the first 300 meters, then 1:30 and 1:30 for the next two laps. The last lap was the fastest in 1:24, as it should be. I always aim to run negative splits. Di blasted by me in the last 200 meters and finished a few seconds ahead of me. I guess I expected that. She is amazing in her ability to pace herself and run negative splits. She does it nearly every race. She does it so perfectly that I never worry if she happens to be in last place on the first lap or two of her 3200 meter races. I know she will run those negative splits and catch so many that have gone out too fast ahead of her. She works so hard and has truly become a student of her sport. She learns all she can to be her best. As a coach, I feel very proud watching her races unfold so perfectly. And she has one heck of a kick. After the 1500 meter time trial, we ran 6 x 400 meter repeats. My goal was 1:20 but I really didn’t know if that would be possible after the 1500. The four of us lined up in lanes, using the stagger. Something most of us had not done before since we don’t race the 400 and when running them in training we usually just run in lane one. Maverick started us on each one. Again, me trying to just run and not be coach today. I went out pretty fast in lane 4 and crossed the finish line in 1:18. I could hardly believe it. My legs were a little wobbly but I was pretty excited. We hit 1:18 again. Changed into some racing flats and ran the third one in 1:17. Whoa. Didn’t care for the racing flats so ran #4 in them just to be sure and crossed in 1:19 then changed back to my other shoes. By the fifth 400 my legs were pretty heavy and wobbly as I walk/jogged the recovery lap. That would be my slowest in 1:20. But this was my original goal pace so not too bad! I thought I would have nothing left for the sixth 400, especially as the other three runners made up the stagger and flew by me with more than 200 meters to go but I still managed a 1:16 which is pretty amazing for these 36 year old legs! I have not run 1:16 since my college days. It was hot, I ended up sunburned, but had one of the best speed workouts I can remember. Training with a group is definitely more fun, can really help you push past your personal limitations, and allows you to share in the joy and pain of running fast. I must say that I did not feel 36 years old today. I know I have lost some leg speed over the years, but today I could almost visualize myself running track workouts at the Brown stadium or at the old cinder track at the old Palmer High School (Monson did not have a track when I was in high school). I almost felt like a teen again. Coaching definitely has great benefits like getting to know amazing young runners like the ones I shared a two hour workout with today. 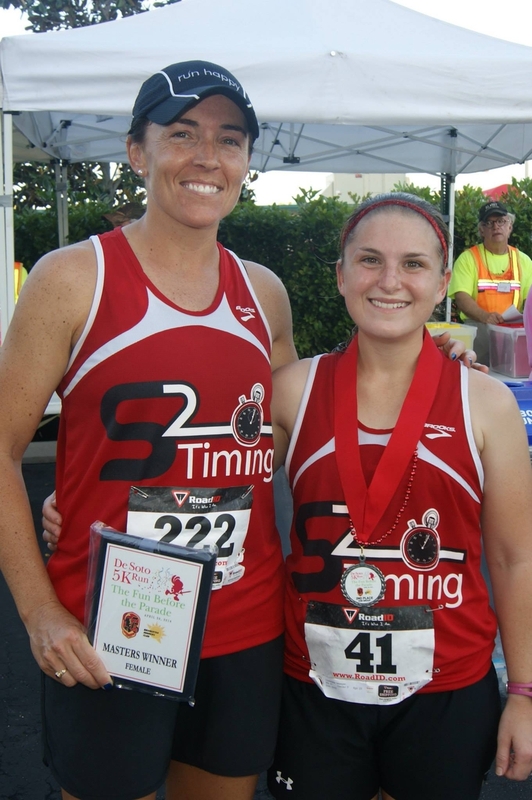 Team RunnerGirl won the Gasparilla Marathon Relay for the fourth year in a row on February 28, 2010. While this is extremely exciting news, I also felt a little let down once crossing the finish line for the final time. 2010 marked the tenth and final running of the Gasparilla Marathon and along with it, the marathon relay ended with the highest number of teams participating in the event’s history. I am sure that the increased participation was partly due to this being the “Final Voyage” (embroidered on the back of the marathon and relay shirts). Out of 118 relay teams consisting of all male, all female, mixed, and masters teams, RunnerGirl was second across the finish line behind only an all male team. The RunnerGirls won the overall female division for the fourth year in a row in a time of 3:03:00 which was over 30 minutes ahead of the second place female team. RunnerGirl has dominated the team events at Gasparilla. I know this might sound like bragging, but I want to give credit to the incredibly talented and hard working women who have made up Team RunnerGirl over the years. In 2005 Gasparilla added a team element called the Chick-Fil-A Team Trio where times were combined from the 5K, 15K, and half marathon. Kelly Fear ran the 5K, Rachel Chambers ran the 15K, and Rae Ann Darling Reed ran the half marathon for their first Team Trio victory. In 2006 Team RunnerGirl again brought home the gold, which was not gold at all, but a giant stuffed Chick-Fil-A cow and a year’s worth of free Chick-Fil-A for each team member. Melissa Reifschneider ran the 5K, Rachel Chambers ran the 15K, and Rae Ann Darling Reed ran the half marathon. Then in 2007 Team Trio was replaced by the Gasparilla Marathon Relay where four runners cover 26.2 miles by running 7 miles, 7 miles, 8 miles, and 4.2 miles. The runners exchanged an ankle strap with timing chip on it at each of the relay exchange points. The team then met the final leg at the Davis Island Bridge so the four could run the last quarter mile together and cross the finish line as a team. RunnerGirl won the female division of this inaugural event in 3:09:12 with team members Cherie Coston, Rae Ann Darling Reed, Rachel Chambers, and Pam Chaffin. In 2008 Team RunnerGirl defended their title with their fastest marathon relay time of the four years: 2:59:44. 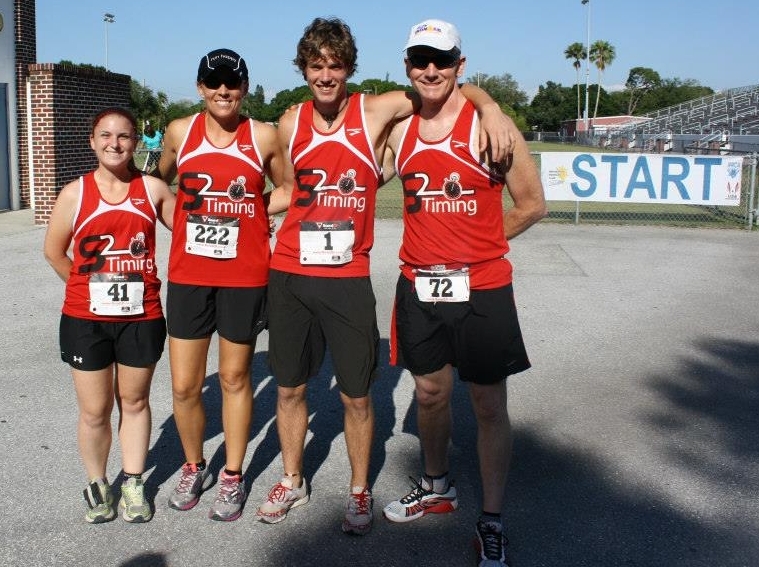 This team featured two professional triathletes from Southwest Florida which helped the team run its personal best marathon relay time. The 2008 team was Rae Ann Darling Reed, Heather Gollnick, Heather Butcher, and Pam Chaffin. In 2009 RunnerGirl won again in a time of 3:12:59 despite windy and rainy conditions. I was set to run the first leg this year but was diagnosed with a stress fracture just a few weeks before the event. Luckily the fastest distance runner on the high school cross country and track team that I coach was available to take my place. 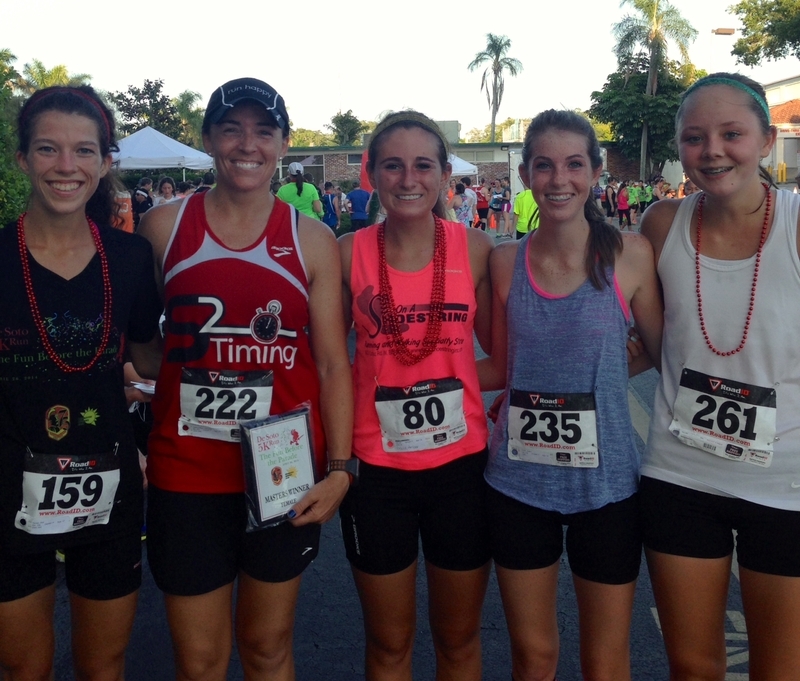 Responsible for Team RunnerGirl’s 3-peat were Jessica Pate, Melissa Reifschneider, Heather Butcher, and Pam Chaffin. Then 2010 brings us to the 4-peat for Team RunnerGirl with Rae Ann Darling Reed, Shana Bickel, Heather Butcher, and Diana Nelson. As I mentioned, it was very exciting to win again this year, but I also felt the disappointment knowing it was the final year of this event. I am hopeful that Gasparilla will come up with some new creative team or relay event in 2011. But getting back to “How to 4-Peat.” When putting together these teams over the years, I kept it really simple. I looked for runners who were faster than me. That’s it. That’s my secret. Using this simple method to put together racing teams, I found that I stepped outside my comfort zone and did not just ask friends or people I already knew to be my teammates. In doing this, I have met some of the most amazing runners and triathletes in my area. I mean, how cool is it to say that I ran a relay event with teammates who have competed at and won Ironman Triathlons, Triathlon World Championships, National Triathlon and Duathlon Championships, and so many others. Team RunnerGirl has been so incredibly rewarding with the team titles we have won but even more rewarding with the amazing athletes I have gotten to know and now consider friends. 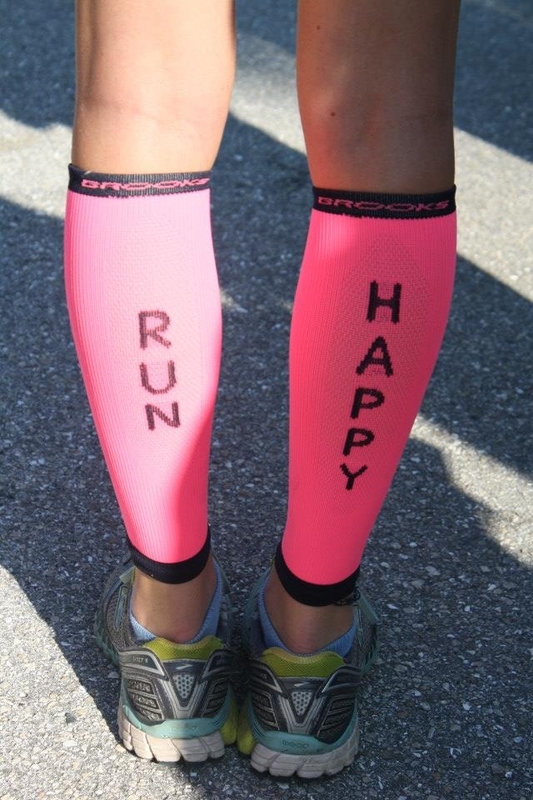 A sincere thank you goes out to all the amazing women who have run as part of Team RunnerGirl over the years.